There are far fewer wooden roller coasters than steel, and since a large number of these are over 50 years old anyway you can imagine there are also far fewer wooden manufacturers out there. There is still fierce competition in the market, and here are the main contenders. What They’re Known For: Midsize wooden roller coasters. Great Coasters opened for business in the mid 90s in a clear attempt to grab a section of the market that CCI (see below, different company confusingly similar names) was dominating. The problem was their rides weren’t anywhere near CCI’s quality; two early coasters, Gwazi (Busch Gardens Tampa) and Roar (Six Flags America and Discovery Kingdom), are infamously rough. However when CCI went under, the company seemed to up their game in response. 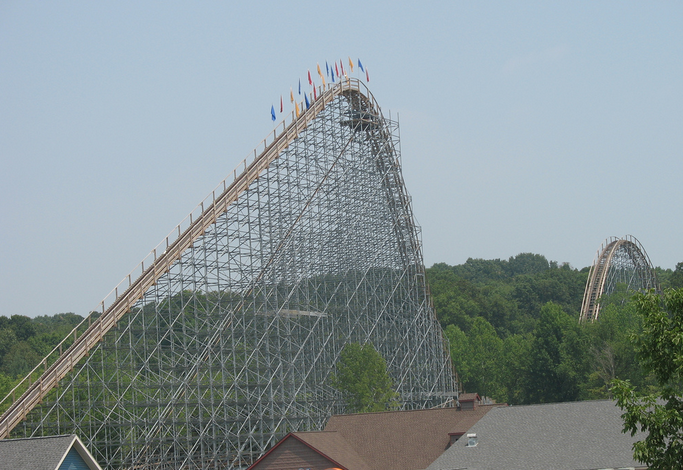 Thunderhead (Dollywood) set the trend in 2004 before they began building for Six Flags and Cedar Fair regularly. How To Spot ‘Em: Their rides usually have very twisted layouts, with numerous crossovers. There’s little to distinguish between the actual track of wooden roller coasters. What They’re Known For: Larger wooden roller coasters. Gravity Group was formed by a team of designers from CCI and they have continued to provide the same high quality their alma mater company delivered. They haven’t been as popular as GCII, but they’re made recent inroads in the Chinese market, and their signature ride, The Voyage (Holiday World) is considered amongst the best in the world. How To Spot ‘Em: As with GCII, there’s no real way of telling each wooden track from another, but Gravity Group typically employ long out-and-back style layouts with numerous airtime hills. They also often use steel scaffolding as supports (no, that doesn’t mean they’re steel roller coasters; the track material is what defines whether it’s wood or steel). Although most of their rides are large, they have also built a couple of very small, twisted coasters; these family rides are far smaller than anything GCII have built. What They’re Known For: RMC are the new boys on the block. Well, kind of. They’ve been physically constructing roller coasters (as in putting other people’s designs together) for the past decade or so, but only in the last few years have they actually started building their own. Iron Horse: a very unusual innovation called which uses steel I beams (used in construction) as rails. 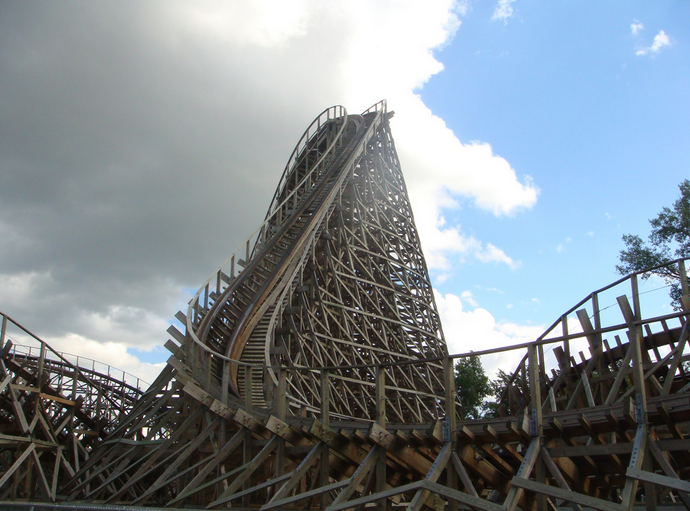 It is used to renovate large, old wooden roller coasters. The wooden track is stripped off and a better engineered, more complex steel version installed on top of the supports. The scheme is genius because it provides a new lease of life for old roller coasters, gives parks a huge, new, marketable ride, and is comparatively cheap. Technically they are steel coasters, not wood. Topper Track: Generally a wooden roller coaster has two rails made of a stack of wooden sheets all laid on top of each other. Obviously if a wheel were to run directly on this wood it would tear it up, and so a thin sheet of metal is laid on top as a running groove. RMCs design replaces the top two layers of wood with steel, and therefore provides a much smoother ride. It can also handle inversions, which regular woodies can’t. Many argue it’s a steel coaster with wooden supports, but either way the only one they’ve built so far opened to critical acclaim. They’re the most interesting thing to happen to the industry in ages, and with their 2014 plans unveiled for the world's fastest woodie, hopefully we’ll see even bigger things from them over the next few years. How To Spot ‘Em: Garish red track on top wooden structures, or wooden roller coasters doing things you wouldn’t expect! And of course there is also Intamin, the predominantly steel manufacturer who I mentioned in that article, whose prefabricated wooden roller coaster designs are frequently rated as being some of the best in the world. Custom Coasters International (CCI) (d.2002) CCI existed for just 11 years, originally as a revamped version of another former manufacturer, the Dinn Corporation, and yet they still managed to produce some of the most legendary roller coasters of all time. They built wooden roller coasters exclusively, and paved the way for similar companies in the 21st century. So dominant were they that a CCI coaster topped the Mitch Hawker poll every year from 1996 to 2002. One of the reasons they went down may have been their low prices; Megafobia (Oakwood, Wales) cost only $3 million (Although this was in part due to a deal to get other European parks exposed to CCI’s rides). So there we have it. This is by no means every manufacturer out there; there are dozens of smaller firms that have built plenty of decent rides, but this covers the main competitors in today’s market. But, in terms of wood and steel, what’s the difference? Many see wood as the old and steel and as the new, they see wood as the unsafe, limited version and steel as the advanced, more capable counterpart. It’s true that woodies were around far earlier, and it’s harder to have them negotiate complex track layouts and elements, but at the very top of the chart the wooden roller coaster reigns supreme. They provide a more out of control sensation, and whereas steel rides are designed to deliver huge drops, inversions and powerful launches, woodies are far less gimmicky and therefore rely more solely on pure enjoyment; most people would agree that the very, very best wooden roller coasters are in a league of their own. So why don’t more parks build them? Clearly from the list you can see they cost a great deal less. The simple answer is faith. A ride might be great, but that means nothing if you can’t attract people to ride it. Woodies are hard to market for all the reasons above; the public perceive them as slow, tame, old and most crucially unsafe attractions. You can cause much more of a stir with the world’s first 14 looping roller coaster, but in the long term a truly great roller coaster will continue to draw in the crowds (See Lake Compounce (Connecticut), home of Boulder Dash and Oakwood (Wales), home of Megafobia.) We can only hope parks have more faith in the future and start pulling the numbers up!